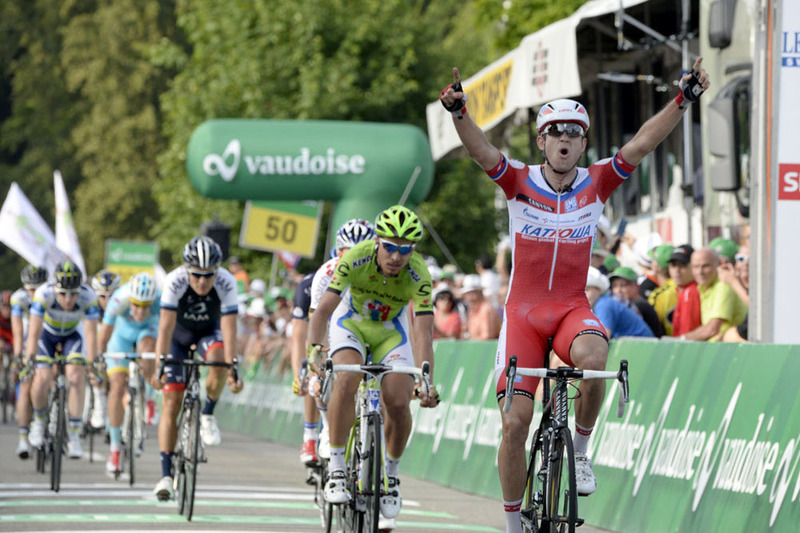 Alexander Kristoff (Katusha) got the better of Peter Sagan (Cannondale) in the bunch sprint at the end of stage five of the Tour de Suisse on Wednesday. Sagan came home for second, with the previous day’s winner Arnaud Demare (FDJ) in third. Overall race leader Mathias Frank (BMC Racing) finished in the same time as Kristoff to keep the yellow jersey. Stijn Devolder (RadioShack-Leopard), Cyril Lemoine (Sojasun), Sebastien Minard (Ag2r) and Serge Pauwels (Omega Pharma-QuickStep) had escaped the peloton earlier in the day, but with a bunch sprint beckoning they were never going to be allowed to stay clear. Sure enough, the quartet were caught with 25 kilometres to go. Jorge Azanza (Euskaltel) put in an attack on the final ascent of the Zurzacherberg, the last of five fourth-category ascents in the last third of the day’s route. He was swiftly caught after the summit as IAM Cycling and BMC Racing wound up the pace on the descent. Cannondale and Sagan looked to be in the perfect position coming into the final kilometre, with the road rising up slightly in the final 500 metres. 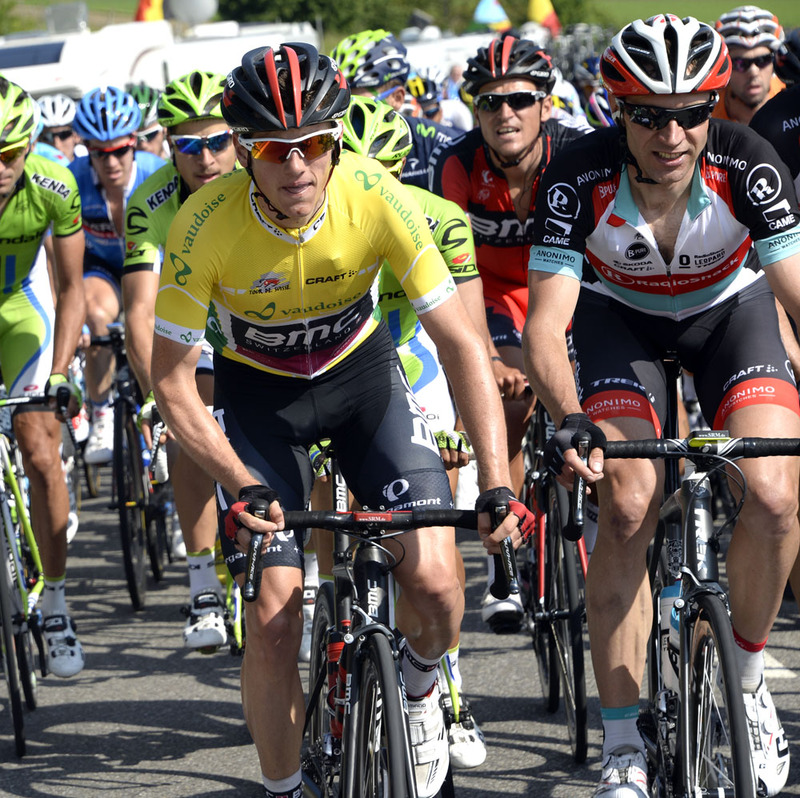 Kristoff marked Sagan as he upped the pace, and then out-kicked the Slovak to take a convincing win. Giovanni Visconti (Movistar) started the day in fourth place overall, but a crash saw the Italian forced to withdraw from the race with concussion. Michele Scarponi (Lampre) was also caught in a crash, but he quickly re-mounted and chased back up to the peloton. British sprinter Ben Swift (Sky) dropped off the pace during the day after suffering from stomach troubles during yesterday’s stage, and finished in a group at 8-51 behind Kristoff. He is the last placed rider in the general classification. Josh Edmondson (Sky) is the highest-placed British rider in the general classification in 39th place, 9-21 adrift of race leader Frank. Wednesday’s stage six features a couple of third category climbs long its 176km route from Leuggern to Meilen, but with a flat run-in to the finish that should once again suit a bunch sprint. The WorldTour-level race concludes on Sunday with a decisive 26.8km individual time trial.